Table of Contents Next: Wright, Carleton H.
Wotje (170.244E 9.450N) is a large (30 miles or 50 km long and 12 miles or 20 km wide) atoll in the Marshall Islands. Wotje’s capacious lagoon had room for 2000 ships, and could be reached by four passes (the deepest 15 fathoms). It also had enough land for an airfield, making it an excellent candidate for a naval base. The Japanese had constructed perhaps their strongest base in the Marshalls here by 1941, with 1050-meter (1150-yard) and 1500-meter (1640-yard) runways at Otdia airbase, but no aircraft were yet based there when war broke out in the Pacific. 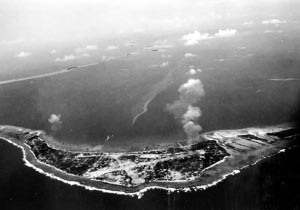 There was also a seaplane base, numerous antiaircraft and coastal batteries, and a system of roads and trenches,The atoll was garrisoned by 53 Guard Force, which arrived just before war broke out. The atoll was bombarded by a cruiser force under Spruance on 1 February 1942 and by an Allied battleship force on 29 January 1944, during the Marshalls campaign. Thereafter the atoll was bypassed, and though it was repeatedly bombarded by air and sea, it remained in Japanese hands throughout the war. Two night evacuations of the native population were carried out by the Allies, in September 1944 and March 1945, which brought out over 1100 civilians.